Swimming with dolphins was on my bucket list for a long time, but as a paraplegic I wasn’t sure how this would happen. After some research, I found Discovery Cove in Orlando. 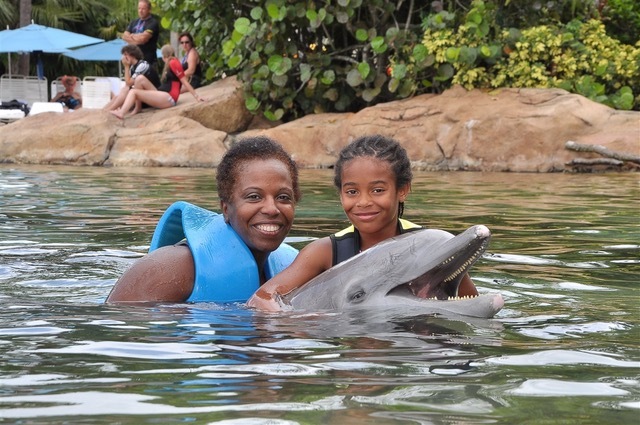 I learned they provided park accessibility including the dolphin swim! So, with a lot of zeal and excitement, this single, wheelchair-using Momma and her little girl set out to for a memory-filled experience. Upon our arrival, we were greeted at the main entrance and directed to registration. We received additional instructions, and told there was a beach chair I could use to maneuver throughout the park and beach areas. I felt great. However, there was one small detail that I hadn’t considered. The beach chair needed to be pushed by another person. Uh oh. I knew my 10-year-old couldn’t traverse in the heat and sand to assist. Realizing our dilemma, the Discovery Cove team told me to wait a moment, as they went to an office to discuss the situation. When they returned, the manager said, “we are here to serve you’ and told me one of their young staffers would assist me. Tears of gratitude came to my eyes. My daughter and I quickly changed into our wet suits and set out for a memory-making day. The beauty of this experience was that I was just a mom. I wasn’t a mom with a disability or limited in any way. As we floated in the lazy river my daughter said, ‘this has been the greatest day, Mommy.’ We had so much fun that we went around the lazy river three times, while the Discovery Cove staffer inconspicuously sat on a rock and said for me to signal to him when I was ready to get out. The words “we are here to serve you” are ones that I’ve taken to heart and now share with my clients. When a customer with a disability hears and sees that companies are committed to creating a seamless guest experience, like me, they will become your brand’s ambassador and tell all of their peers with and without disabilities. This isn’t just a story about a vacation. It’s about creating a memorable, disability inclusive guest experience. Discovery Cove provided accessible dressing areas, level pathways and beach wheelchairs. However, they took the experience a step further by providing a real-time solution. You don’t need a big budget if you understand what people with disabilities need. When you equip your staff to be disability inclusively customer centric, you’ll create repeat business and customer loyalty. I know this is true as I’ve been to Discovery Cove twice; and the second time with seven additional people. I’ve shared my experience with peers and colleagues – with and without disabilities. My friends who’ve gone have had an enjoyable experience as well. And, they tell their circles of influence. How has your company created a disability inclusive guest experience and how has this improved results?